It's probably the most glamorous storefront theater in Chicago, its façade recalling a Sinatra-era Hollywood lounge. Buildings of this vintage are nowadays most often found in the suburbs, refurbished with an eye to providing weary grandparents with nostalgic memories. That's exactly what the Windy City Playhouse is not, though. Its quarters in what was once a caterer's showroom and the absence of a parking plaza make its design unmistakably urban. Its sleek black-and-chrome lobby houses a full bar with signature libations and fancy snacks, while its auditorium boasts comfortably-upholstered tub chairs ranged around cocktail tables. What's more, you can see plays here—not dinner-and-a-show stalwarts like Steel Magnolias or Nana's Naughty Knickers, but smart, contemporary dramas like the currently-running (and recently extended) Stick Fly, Lydia R. Diamond's satirical look at rich, privileged African-American families. So just what do co-owners Amy, Milan and Joshua Rubenstein think they're doing? "Many city-dwellers are fond of art, concerts, movies, fine dining and social events, but don't know yet that that theater, too, can fulfill all those interests." explains Amy Rubenstein, herself a former Chicago-area actress, "We had a distinct vision for showing them how enjoyable it can be—but our plan didn't mesh with the entry-level experience of being an itinerant company, or a strictly rental space. The only way to retain artistic control of the entire venture was to open our own theater." A one-stop night on the town sounds like a better fit for the lakefront than a commercial street bordering Ravenswood and Irving Park—two neighborhoods long associated with quiet family residences and streets largely deserted after nine o'clock. Rubenstein disagrees, "This district is attracting working professionals and young couples who have been priced out of Andersonville and Lincoln Square, and they are very supportive of late-night activities, especially those relating to the arts. Our location so close to an expressway exit also makes us accessible to people from nearby communities who are looking for a quality theater experience, but don't want to drive all the way downtown." The Windy City Playhouse's first season features an eclectic bill of fare—variety, says Rubenstein, arising from the considerable freedom offered directors in defining what constitutes "entertainment." In addition to comedies such as Neil Simon's Chapter Two and Peter Ackerman's fresh-off-Broadway bedroom farce, Things You Shouldn't Say After Midnight, (both arriving later in the year), its flagship voyage also includes family dramas like Deborah Zoe Laufer's's End Days and the aforementioned Stick Fly. "What these shows all share," Rubenstein reminds me, "is a focus on the problems of real people, as well as an unaffected conversational writing style. We consider this to be an important aspect of attracting audiences new to the theater. 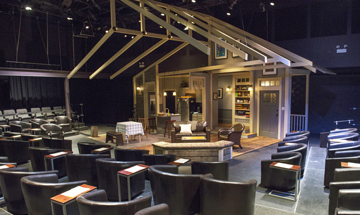 It's easier to connect with the performance when you don't have to struggle with blank verse or expressionistic scenic effects." Does the Playhouse ever get customers coming just for drinks? "We do, indeed—and we welcome them, too. Some are theater regulars, but many are people wanting to see if they like the room's atmosphere before committing to a whole evening. Eventually, we hope to offer post-show entertainment like live musical acts or comedians, but in the meantime, we'd love to see the Playhouse become a gathering place for artists to relax and chat." Since it may be awhile before this northwest corner achieves the destination cachet of Wicker Park, let's say, as an all-ages refuge for revelers, I mention to Rubenstein that during the 1980s, a multiple-use arts venue in the Belmont-Sheffield hub called CrossCurrents offered on-site child-care to accommodate parents in need of a spur-of-the-moment date-night out. Rubenstein's eyes light up, "Baby-sitters? Now that's an idea!"